Corporations have been stockpiling cash awaiting promised tax reform. Enterprises have delayed capital investment, hiring, and cash allocation in anticipation of promised tax features such as lower rates. In February of 2017, the Secretary of the Treasury promised comprehensive tax reform before the August recess. Because tax reform along the lines or scale articulated by some in government to date seems unlikely, I encourage businesses to consider deploying their capital more profitably than holding it in reserve. I reviewed the circumstances generally present in the environments of each of the last eight significant tax reform acts. I found three factors present in the majority of them and offer here my view of why their presence then, and their absence now, bodes poorly for sweeping tax reform. 1. Lobbyists need to be kept at a distance or soundly aligned with the reform goals. Thus far, Congress has led with its chin by pushing such things as the Border Adjustment Tax and lower corporate tax rates. Now, K Street is already fully immersed in the process, either for or against. Neither required element of "Fair" or "Simple" is any longer possible. 2. 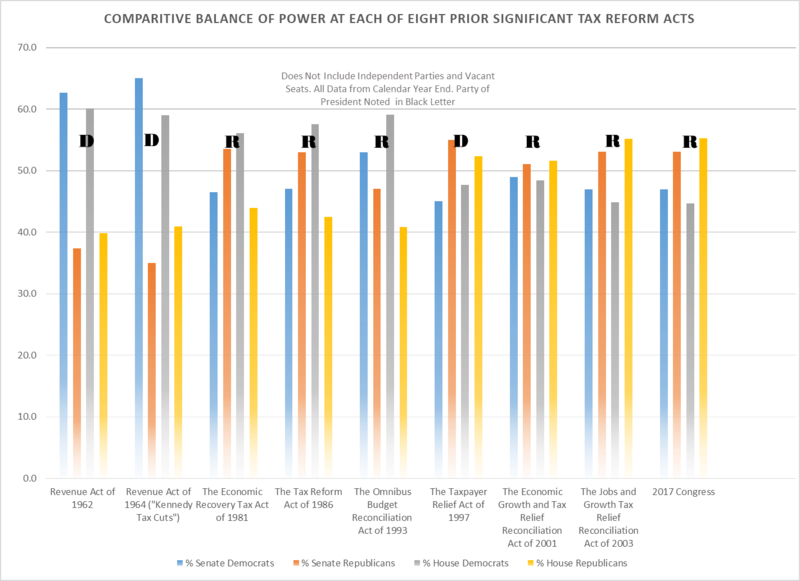 A government more or less evenly divided, as it was in 1986, is essential so that no one party has to suffer the fallout from substantial tax reform. Division is considered not just by party within the legislative branch, but also as between the Houses of Congress and the president. See the chart below for an illustration of how this has shaped up in years when tax reform has passed. Also, recall that within 20 years after TRA 1986, over 15,000 changes to the tax law, most incrementally rolling back the changes, had already been made. 3. Revenue neutrality is a necessarily stated goal of tax reform. In 1986, Representatives took turns at the podium declaring their support for a bill that neither raised nor lowered government revenues. With a current budget deficit of about $440 billion, a tax gap of about $410 billion, and the largest income polarization in history, it’s going to be a tough sell to offer revenue neutrality. Without it, there can be no meaningful tax reform. Given that none of the factors that have been historically required to accomplish sweeping tax reform are now present, I suspect we will not see it this year or in 2018. This memo is intended only as an illustration of general principles. It is not intended as legal or tax advice. The reader is cautioned to discuss his or her specific circumstances with a qualified practitioner before taking any action.